Why are Diamonds so special? What are Diamonds used for? How are diamonds mined by Petra? Read more about how Petra is shaping its future. Our business will be transformed once our expansion programmes have opened up access to new blocks of ore, undiluted by waste rock. This 12-carat, internally flawless, fancy, vivid Blue Moon diamond was cut from the 29.6 carat rough stone discovered at Petra’s Cullinan mine in January 2014. Petra announces its Q3 FY 2019 trading results today, Monday 15 April 2019. Click below for more information. For a brief overview of the diamond lifecycle click here. See what our employees say about working at Petra Diamonds. 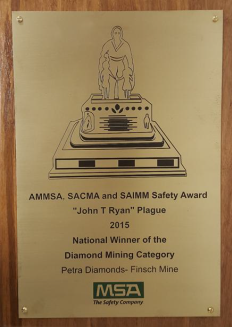 For the second consecutive year, Petra’s Finsch Mine is awarded the “National Winner of the Diamond Mining Category” for safety at the 2016 Mine Safe Awards in South Africa. 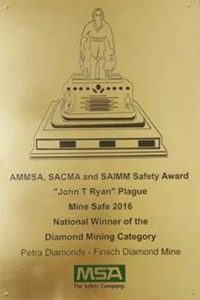 The Finsch mine again demonstrated its commitment to ensuring excellence in the vital field of safety when it received two awards at the 2015 MineSAFE conference. 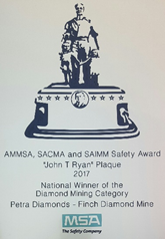 Finsch was awarded the ‘Best Improved Safety Performance’ in the Diamond Mining Category and the ‘John T. Ryan’ Plaque for Nation Winner of the Diamond Mining Category’. The annual MineSAFE conference was held at Emperor’s Palace in Johannesburg from 26-28 August 2015 and culminated with the 2015 MineSAFE Awards. The two awards won by Finsch are recognised by the Association of Mine Managers of South Africa (AMMSA), South African Coal Managers Association (SACMA) and South African Institute of Mining and Metallurgy (SAIMM). Finsch’s stringent approach to safety was commended recently when the mine won first place in the Northern Cape Mine Managers’ Association (NCMMA) awards. A focus on health and safety underpins everything we do at Petra and this award demonstrates the continual efforts made by all employees and contractors at Finsch to strive towards a ‘zero harm’ working environment. 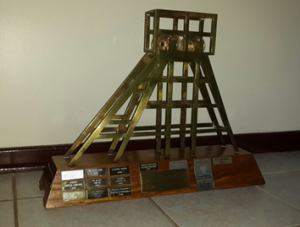 On Friday 28 November 2014, the NCMMA held their year-end function and 2014 awards ceremony in Kathu, hosted by Khumani Mine. 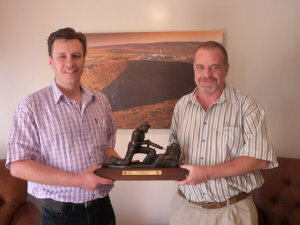 Finsch, which was entered in the underground mines ‘Division A’, achieved first place in the safety category. The Williamson mine in Tanzania gained recognition for its sustained commitment to employees when the mine won an award for the best complying employer in the mining sector at the National Social Security Fund (“NSSF” or “the Fund”) assessments, carried out to identify companies that excel in terms of social security provision to employees. The NSSF, formerly the National Provident Fund, was established in 1964 and therefore celebrates it Golden Jubilee this year. To mark its 50th year, the NSSF carried out assessments by sector, taking into account certain criteria such as the timely payment of both employer and employee monthly contributions to the Fund, the relationship between employer and the Fund, the compliance of companies with Social Security Scheme Regulations as well as the total number of employees registered with the Fund and their continuous contributions. The winning award for the mining sector award was presented to Ignas Balyoruguru, Human Resources Manager at Petra’s Williamson Mine, by His Excellency President Jakaya Mrisho Kikwete of Tanzania on 13 May 2014 in Arusha. 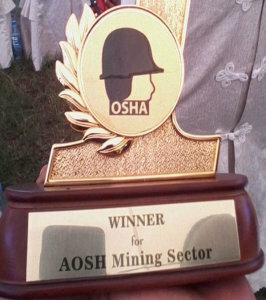 Award for Occupational Safety and Health in mining, as part of Tanzania’s activities surrounding the national Occupational Health and Safety Day 2014. The Williamson mine’s outstanding approach to Occupational Safety and Health (OSH) has been acknowledged by its success in winning the Award for Occupational Safety and Health in mining, as part of Tanzania’s activities surrounding the national Occupational Health and Safety Day 2014. The event took place in Dar es Salaam with Company interviews and discussions over the period 26 and 27 April. The exhibitions took place on Monday 28 April and on that day, the winners was announced. Williamson produced a well-planned exhibition booth portraying its holistic health and safety culture, which included the introduction of an effective lock-out simulation board. ‘Lockout-tagout’ is a safety procedure which is used to ensure that machines or systems (Plant Modules) are properly shut off and not started up again prior to the completion of maintenance or servicing work. It requires that hazardous power sources be “isolated and rendered inoperative” before any repair procedure is started. The unique simulation board replicates the safety devices in the Plant for these purposes and it can be used very effectively in Safety Training, Risk Assessments and Safety/Toolbox Talks. In commemoration of Tanzania’s annual Occupational Health and Safety Day 2014 and as a part of the national OSH promotion and awareness creation activities, the Occupational Safety and Health Authority (OSHA) organised the Awards for Occupational Safety and Health (AOSH) in collaboration with the Association of Tanzania Employers (ATE), the Trade Union Congregation of Tanzania (TUCTA), the International Labour Organization (ILO) and the Tanzania Government Chemist Laboratory Agency. The aim of the awards is to encourage private and public workplaces throughout Tanzania to develop, implement and evaluate strategies that help achieve a healthier and safer work environment. All employers in both public and private sectors were eligible to participate in the following categories: construction; financial; manufacturing; agriculture; mining; services; and transportation. The prize giving ceremony took place on 28 April 2014 and the award was handed over by the Vice President, Dr. Gharib Bilal. Finsch’s Luctor Roode (General Manager) and Andy Douglas (SHE Manager) proudly holding the MineSAFE award Petra’s Finsch Mine in South Africa was chosen as Best in Class in the MineSAFE Awards 2013 for the diamond sector. This follows the mine achieving a 52% improvement in its total injury frequency rate (“TIFR”) for the period from 1 July 2012 to 30 June 2013, which was the best rate of improvement for the sub sector. In line with one of Petra’s core values ‘Let’s do it better’, this award serves as an endorsement of the tremendous efforts of all employees and contractors currently working at Finsch to bring about continuous improvement with regards to safety performance. The MineSAFE awards 2013 were held as part of the MineSAFE 2013 Conference, which took place from 22-23 October 2013 in Johannesburg. The conference brought together all those involved in health and safety in the South African mining industry, in an endeavour to bring about meaningful change. The conference is a combined effort between the SAIMM, AMMSA and SACMA with valued input from the DMR, Chamber of Mines, NUM, Solidarity and UASA. The President of Tanzania, his Excellency Dr. Jakaya Mrisho Kikwete, hands over the trophy to the Williamson General Mine Manager, Charl Barnard. The Williamson mine gained national recognition for its commitment to Corporate Social Responsibility by winning awards in two areas of Tanzania’s Presidential Award on Corporate Social Responsibility and Empowerment in August 2013. The mine won certificates for Empowerment and Employment and was the runner up in a further three areas (Procurement, Water Programs and Education). 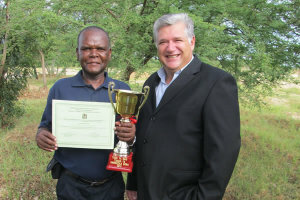 Williamson was also presented with a trophy as overall winner for the Year 2012 in the category: Large Scale Minerals Projects. The Presidential Award on Corporate Social Responsibility and Empowerment was launched on 28 February 2012 by Tanzania’s Mining Inter-stakeholder’s Forum in collaboration with the Ministry for Energy and Minerals. 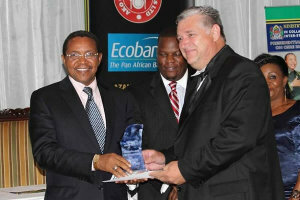 The inaugural award ceremony was held on 20 August 2013, officiated by his Excellency Dr. Jakaya Mrisho Kikwete, the President of the United Republic of Tanzania. This annual Presidential Award is divided into six categories, including ‘Large scale mineral projects’, within which lies the Williamson Mine, and seven areas, consisting of Health, Education, Water, Infrastructure, Local Procurement, Employment, and Empowerment. Johan Langenhoven (centre) accepting the award on behalf of Finsch mine and Petra Diamonds from John Sanins (left), Solutions Executive for Process Manufacturing at Bentley and Anne-Marie Walters (right), Global Marketing Director for Industrial Process and Operations of Bentley Johan Langenhoven, a survey analyst at the Finsch mine in South Africa, entered a project he is leading into the competition on behalf of Petra Diamonds and this project was adjudged the winner in the ‘Mining and Metals’ category of the competition following the final presentation in Amsterdam during November 2012. The (Bentley Systems®) Be Inspired Awards programme recognises the world’s most outstanding infrastructure projects. The projects are submitted by Bentley’s software users and judged by a jury of independent experts, who adhere to the highest standards in determining which of the projects exemplify innovation, superior vision, and an unwavering commitment to exceptional quality and productivity. Bentley shares the innovation in best practices among the infrastructure professionals who make these projects possible by featuring their outstanding achievements across the globe in The Year in Infrastructure series of publications and special editions. 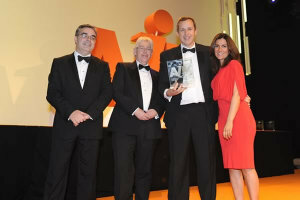 For more information, go to http://www.bentley.com/en-US/corporate/be+inspired+awards+event. Mining and metals engineering professionals strive to shorten project schedules and lower operating costs through improved access to mission-critical information. The projects in this category use software to demonstrate both short-term and long-term benefits that not only improve the performance of engineering and construction capital projects, but also increase the efficiency of operations for mines and metals processing and refining plants. Johan Langenhoven has led a highly innovative project to develop an integrated spatial data management system at the Finsch mine, with the objective for this system to manage geospatial data for five departments that were functioning in isolation. The Finsch mine also co-manages the mining town of Lime Acres, for which the GIS-based system captures data and bills residents for water and electricity usage. Survey and plan data are captured and digitised in MicroStation; Bentley Map links features representing the mining lifecycle, town layout, and residential setup; and Bentley Geo Web Publisher makes the geospatial mining and town information accessible to the whole mining group. The Finsch mine is located in the Northern Cape province of South Africa and is one of Petra’s flagship assets. 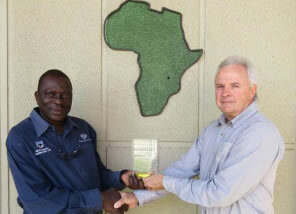 Donatus Mukungu, Williamson’s HSE Officer and Charl Barnard, Country and Williamson Mine Manager proudly holding the award The Williamson mine’s long standing environmental efforts were officially recognised on 5 June 2012, when the mine received the Presidential Award on ‘Water Management and Forestry Conservation’, at both District, Regional and National Level. 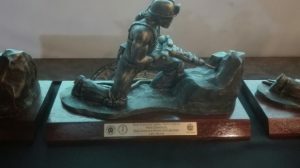 This prestigious award by the President of the United Republic of Tanzania, His Excellency Jakaya Mrisho Kikwete, was made during the World Environmental Day celebrations held in Moshi, Tanzania on 5 June 2012. The environmental competition was initiated by the President in 2010 to promote awareness about environmental management in the country and is carried out from household level to national level, involving different investment institutions, Government institutions, schools, private companies, and NGOs. It is held every two years and this is the second time that Williamson has been honoured, as the mine was named winner at District and Regional level in 2010. 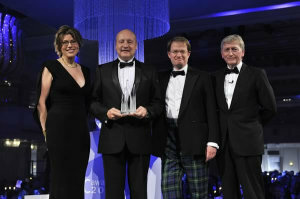 CEO, Johan Dippenaar, accepting the 2011 PLC award for ‘New Company of the Year’. Petra’s step up from AIM to the Main Market in December 2011 was another important development in the Company’s progress, underscoring Petra’s transformation from a junior diamond exploration company to a leading independent diamond producer. The Main Market is the appropriate platform for the Company’s continued growth, allowing a broader range of investors seeking direct exposure to the positive long term fundamentals of the diamond market to invest in Petra. Petra will continue to follow an exceptional growth path as the Company looks to take production from just over 1 million carats in FY 2011 to over 5 million carats by FY 2019. 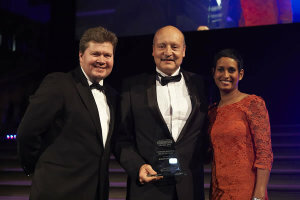 CEO, Johan Dippenaar, accepting the 2011 Quoted Company Award for ‘Emerging Markets CEO of the Year’. 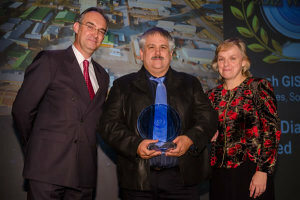 This award recognises the efforts of Johan Dippenaar who, in combination with the Petra team, has led the Company through a period of extraordinary growth, taking Petra’s portfolio of producing diamond mines from three to eight and firmly establishing the Company as a leading independent producer. Johan has over 20 years’ experience in the leadership and management of producing diamond mining companies, having been CEO of ASX-quoted Crown Diamonds (“Crown”) prior to Crown’s merger with Petra in 2005. Petra will continue to follow an exceptional growth path as the Company looks to take production from just over 1 million carats in FY 2011 to over 5 million carats in FY 2019. Petra was awarded AIM Transaction of the Year for the US$192 million acquisition of the important Finsch diamond mine in South Africa from De Beers, further to an equity placing in which the company raised £205 Million (US$325 Million). The acquisition is a continuation of Petra’s strategy to build a world-class diamond mining group. Finsch mine is expected to more than double Petra’s annual production in its first full year of production and it increases the Group’s gross resources base to over 300 million carats (being the world’s third largest diamond resource outside of De Beers and Alrosa). Finsch adds an eighth producing mine to the Group, consolidating Petra’s position as London’s largest quoted diamond mining group and providing a strong platform for the Company’s move to the Main Market of the London Stock Exchange. 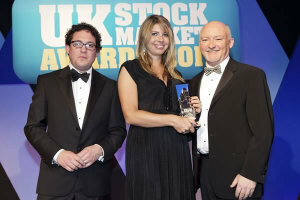 Corporate Communications Manager, Cathy Malins, accepting the 2011 UK Stockmarket Award for ‘Best Investor Communications’. Petra was awarded Best Investor Communications further to the great emphasis placed upon this area by management and the corporate communications team. The Company carries out regular assessments in order to ensure that its marketing materials comply with best practice, and it seeks to convey consistent and clear messages across its website, annual report, presentations and other investor documents. The team is committed to continuous improvement, with the aim that its communications programme will progress and grow in stature, in line with Petra’s exceptional growth profile. 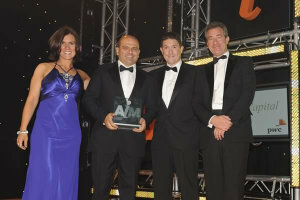 Non-Executive Chairman, Adonis Pouroulis, accepting the 2010 AIM Award for ‘Transaction of the Year’. 2010 was a highly successful year for Petra, when the Company raised US$120 million in an equity fundraising, acquired a further 37% of its flagship Cullinan mine, completed the acquisition of Kimberley Underground mines and sold the 507 carat Cullinan Heritage diamond for US$35 million, the highest price on record for a rough diamond.